Spreading similar responsibilities across portfolios has been a clear strategy of President Juncker, we try to understand why that can be a good thing. 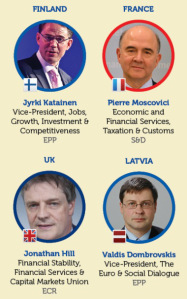 President Juncker announced the portfolios of the new European Commission. As choosing the team of 28 commissioners is not in the hands of the Commission’s President, Mr Juncker could only express his creativity in the definition of the portfolios and in the allocation of the seats. We can conclude that he has been quite creative. Despite the EurActiv leak, which already allowed to get a taste of the new set-up, the final allocation of portfolios left room for a certain fuss. In particular, Mr President has generated debate by breaking up certain portfolios – those dealing with economic and environmental matters for instance – and by merging others – climate change and energy for example.